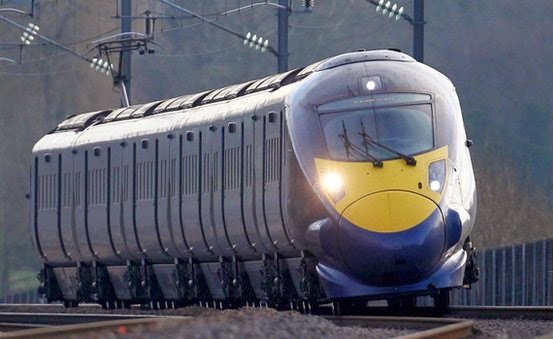 Japanese electronics firm Hitachi says it will move its global rail business from Japan to the United Kingdom. The firm says it hopes the move will help it to expand the rail business to 4,000 workers from the current 2,500. It plans to increase revenue from 2bn euros to 3bn euros ($4bn; £2.5bn) over the next few years. Last July, Hitachi won a £1.2bn deal to make the next generation of inter-city trains in Newton Aycliffe, County Durham, where it is building a factory. That will initially employ 750 workers when it opens next year. The move is an unusual one for a Japanese company, and puts it geographically nearer to its main train-building rivals, such as Siemens of Germany. The BBC's industry correspondent, John Moylan, also says it will boost Hitachi's British credentials in the wake of rows over rail contracts being awarded to foreign firms. In a statement, the Government described the move as a huge vote of confidence in Britain, its workforce and its rail industry. Hitachi manufactures everything from nuclear power plants to construction machinery to televisions; its rail division is relatively small, employing around 2,500 of Hitachi's 326,000 workers. "Today's announcement is a significant sign of intent by Hitachi to grow its business in the rail market," said Alistair Dormer, chief executive of the global rail systems business. "Both the UK and Japan remain important as markets for Hitachi Rail, and with our train factory in the North East of England now under construction, we will work to realise our export potential from the UK, expanding into Europe and emergent markets." Last quarter, the firm reported profits of 126 billion yen ($1.2bn; £725m) for the three-month period to 31 December 2013.